Chaitanya Mahaprabhu appears 500 years ago in a city of Mayapur (West Bengal, India), as devotee of Krishna. He introduced sankirtan, widespread congregational chanting of the Supreme Person’s names, as the most effective means by which anyone can achieve spiritual perfection. By His influence, many of India’s leading religious scholars and their followers became devotees of Krishna themselves. In His youth, Mahaprabhu started a Sanskrit academy in Navadvipa—one of India’s top centers of learning at the time—and earned a reputation as an excellent scholar. But at age twenty-four he renounced everything to travel the subcontinent, encouraging everyone he met to chant the Hare Krishna mantra. He is considered by disciples, scholars and followers to be the latest avatar of Krishna Himself, based on extensive evidence found in Vedic literature. 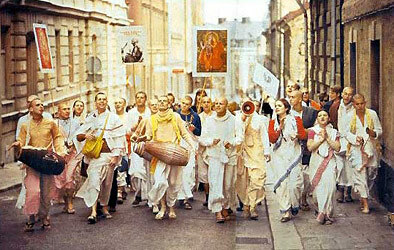 The International Society for Krishna Consciousness, ISKCON, is a continuation of Chaitanya Mahaprabhu’s sankirtan movement. Chaitanya himself left only eight written verses, the Siksastaka, in which he teaches that chanting God’s names is the most simple and sublime spiritual practice for everyone, everywhere. He also showed such extraordinary symptoms of love of God that great scholars among His devotees, including the Six Goswamis, have cited considerable scriptural evidence indicating that Chaitanya Mahaprabhu is Krishna Himself appearing as His own devotee. In 1965 His Divine Grace A.C. Bhaktivedanta Swami Prabhupada brought this knowledge to USA and soon this movement spread out to every country in the world. Nowadays millions of devotees around the globe regularly go out to the streets and parks to glorify the Lord and continue Lord Chaitanya’s mission.